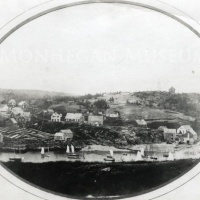 This late nineteenth century image shows the 1784 House on the far right, with the Vaughan house next to it. The barns to the left, near Swim Beach, are no longer standing. The meadow was routinely flooded during the winter months up until the middle of the twentieth century. This large open expanse of ice would be used for skating and ice boating. Thank you for supporting the Monhegan Museum with your purchase of this archival photographic print. This image is printed with an Epson Stylus Photo R2400 with Ultrachrome K3 archival inks on Moab Entrada 100% cotton rag paper. Copyright for this image is held by the Monhegan Museum. Copy Prints are intended for personal use only, such as for framing and displaying on a wall. Copy Prints may not be reproduced or distributed in any form. If you wish to use an image for commercial uses, publication, or any use other than personal use, Please contact the Monhegan Museum.